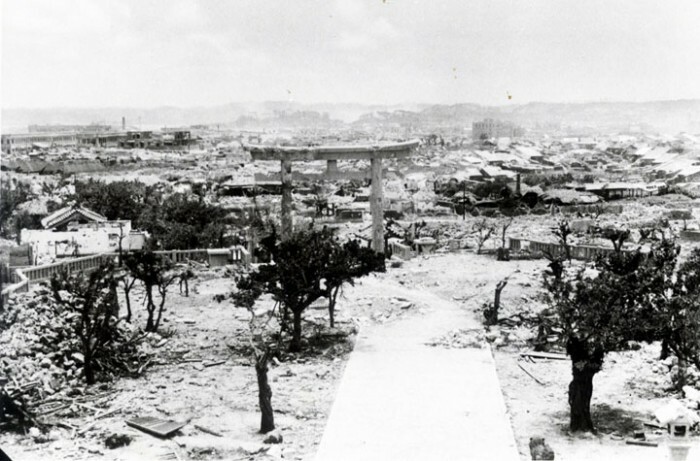 Naha area after the war was completely in ruins. A number of exhibitions and events commemorating the 70th anniversary of the end of the World War ll are taking place around the island in the course of this year. 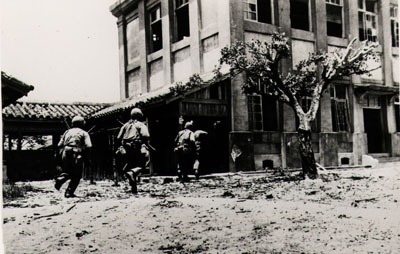 U.S. troops entering Tomari Elementary School building in Naha. An exhibition about changes around the Shuri area through the war to modern day is held at the Naha City Museum of History through July 28th. The exhibition introduces the atmosphere around Shuri and Naha before the war, the situation in Okinawa during the wartime and after, under the U.S. occupation, and tracks the recovery, reconstruction and development of Naha. An exhibit at the Yomitan Village History and Folklore Museum runs through Aug. Many civilians were found trapped on the battlefield between fighting forces or rescued from underground caves where they had sought for shelter. 30th, tracking how the village rebuilt from the devastation of the war. 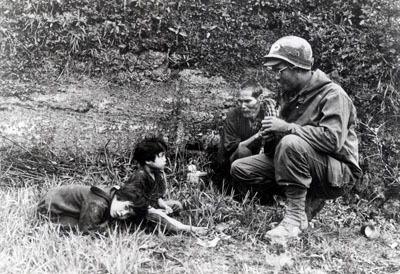 In the early days after the Battle of Okinawa, the U.S. military set up a camp for civilians in Ishikawa, Uruma City. The Okinawa Advisory Council was set up there as well, and politics, economy, education, culture and civic life was reconstructed based in modern day Uruma City. The city has a permanent exhibit of pictures and materials of the history of the rebuilding after the war in the Uruma City Ishikawa Museum of History. As a special event in a commemoration of the 10th anniversary of the establishment of the city through a merger of four municipalities; Gushikawa and Ishikawa cities and Katsuren and Yonashiro towns, a theatrical performance by Higa-za theatrical troupe in ‘Uchinaa guchi,’ the Okinawan dialect spoken by local people mostly in the past, is scheduled to start at 14:00 on Jun. 23rd at the museum. 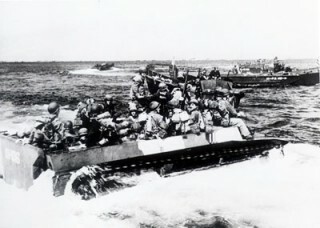 Marines moving towards the landing zone. 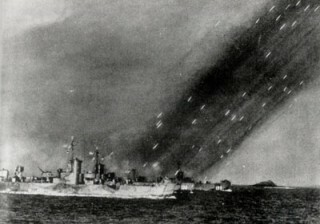 U.S. Navy ships bombarding Okinawa island before the invasion.